Fishermen and Friends of the Sea is calling for independently verified scientific data to be collected and made public on the health of marine life in the South West Peninsula of Trinidad in the aftermath of Petrotrin’s disastrous December 2013 oil spills. The chemical dispersant COREXIT® EC9500A was also used in the near shore area, where we believe it still remains today. Whenever there are rough seas or heavy rainfall, thousands of dead and dying fish wash ashore. This has been occurring for the past three years! We believe this is a serious health concern for the people of T&T and for our ecosystems, please help us lobby for the investigation to into this matter to be re-opened. - Visit these links to watch videos documenting the years of devastation that the oil spill has caused and continues to cause. - Visit this is a link to read the Guardian Newspaper article on Corexit and the on-going fish kills in La Brea. 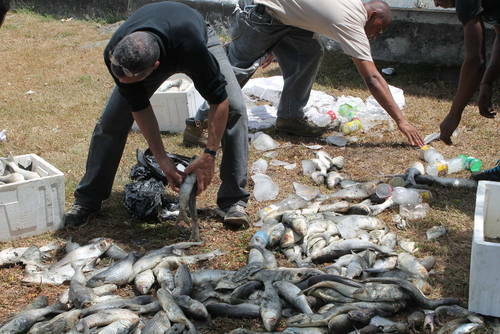 - Visit this link to view our updated Facebook albums showing the fish kills in La Brea. Hertsgaard, Mark (April 22, 2013). "What BP Doesn’t Want You to Know About the 2010 Gulf Spill". Newsweek. The Daily Beast. EPA Whistleblower Accuses Agency of Covering Up Effects of Dispersant in BP Oil Spill Cleanup - video by Democracy Now!